Tea Happiness- A blog on tea drinking, tea history, tea industry interviews, NYC tea experiences! : American Tea History: Who Sipped Iced Tea First? American Tea History: Who Sipped Iced Tea First? Most people assume iced tea originated in the south, since it's such a common sight there. But if you think about it, you can't have iced tea without...ice. Southerners didn't have easy access to ice until the invention of the ice box. 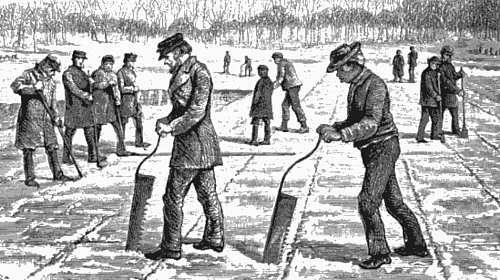 Northerners were able to cut ice from frozen ponds and lakes and keep it through the winter months and beyond due to the weather and a bit of clever insulation. Knowing this, it may not surprise you to realize iced tea most likely originated in the north. One of the first recipes using cold tea can be seen in the Kentucky Housewife cookbook from 1839 for tea punch. ...1868 was iced tea's breakout year. 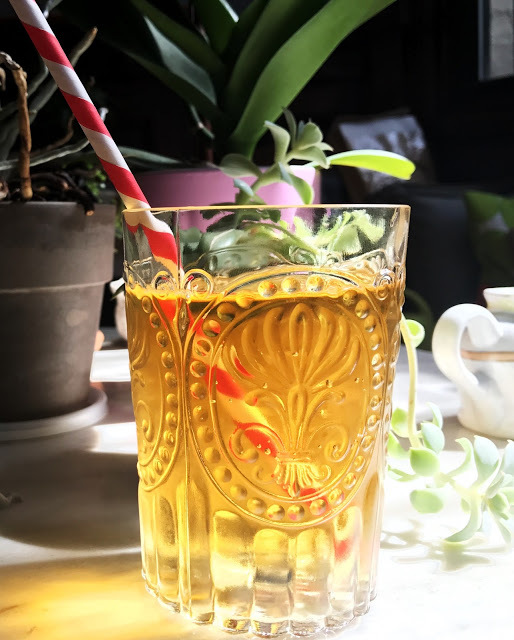 On July 6 of that summer, the Boston Journal declared, "During the heated term there is nothing so invigorating as iced tea. A slice of lemon no thicker than a wafer placed in each tumbler adds to the relish." The New-York Commercial Advertiser ran the same notice verbatim just five days later, and the Springfield Republican followed suit three days after. From the very beginning, sweetening iced tea was a common practice, but it was left to the consumer's discretion. Lemon juice was mentioned more often than sugar in the early notices, but the New York Tribune did advise, on July 27, 1868: "Sweeten the hot tea to suit your taste; then pour it, spoonful by spoonful, into a tumbler filled with ice." 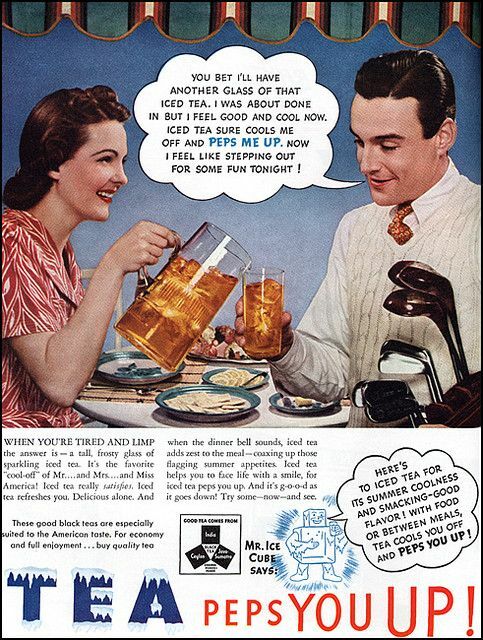 A few years later, the Vinton Record of McArthur, Ohio, said that iced tea "is made by permitting tea to cool, pouring it over powdered ice, and sweetening it with white sugar, to suit the taste." Iced tea was more of a treat in those days, since ice was difficult to come by and sugar was more expensive. But with the aforementioned invention of the icebox, lowering prices in sugar, and black tea becoming cheaper as the British controlled the black tea industry in India and Ceylon, iced tea became more readily available. Black tea became the leaf of choice as it was generally less expensive than green tea. Even later during WWII it became more difficult to find green tea, so black tea became the fashionable choice to serve iced. In my research many resources mention the 1928 cookbook Southern Cooking by Henrietta Dull as publishing the recipe that became the definitive way to make iced tea. If you find the phrase "sweet tea" in a newspaper (even a Southern newspaper) from the 1960s or 1970s, it's almost always referring to hot tea enjoyed in some faraway place, like Egypt, Dubai, or Sri Lanka. That started to change in the last years of the 20th century. In 1989, Kathy Petty, a columnist for the Augusta Chronicle in Augusta, Georgia, joked that "getting a glass of sweet iced tea above the Mason–Dixon line is about as likely as finding a reactor pipe at SRP without a crack in it." ("SRP" refers to the Savannah River Plant, a nuclear facility near Augusta that was famously plagued by defects.) By the 1990s, people were becoming quite emphatic about the linkage. "Southern ice tea is always very sweet," a writer for Alabama's Anniston Star declared in 1994. "It's not Southern tea (and in the South isn't worth much) if it doesn't have a lot of sugar added to it way in advance." So what do you think? If you grew up in the South before the 1980s, do you remember hearing the term 'sweet tea'? Did you sweeten your tea to taste, or have it served already sweetened? I'd love to get your feedback! When I'm down South next week, I'll see if I can do a bit more research. For more posts on tea history, check out my articles such as Who Had The First Sip, Tea and Women's Suffrage, and A Bit of NYC Tea History. I think you'd The Frozen Water Trade by Gavin Weightman, if you haven't read it. When I lived in Boston this was one of the books I read about New England history.